Missouri State University is the home of the Bears. Kristen Sardina thinks the real game changer is the alligator snapping turtle. After Sardina visited the Tishomingo National Fish Hatchery in Oklahoma, she noticed some turtles that were a little different than the rest. They were pink. “These pink turtles have rightfully earned their position as our unrelenting outliers,” said Sardina, biology teaching assistant. The turtles have hypomelanism, a congenital trait that reduces pigmentation in skin. 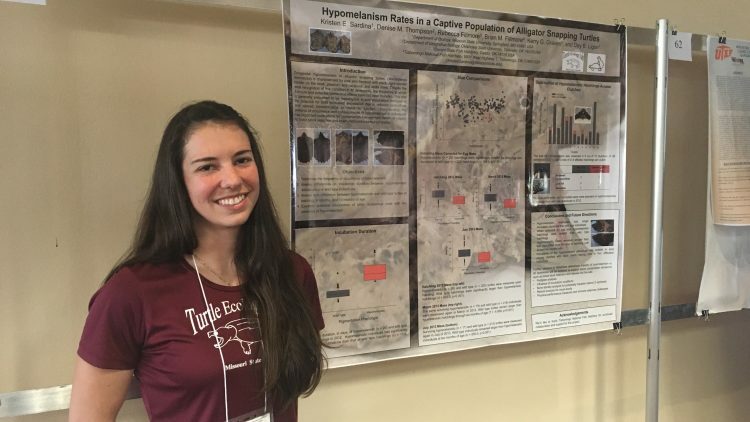 Sardina’s research focuses on the development of an alligator snapping turtle with hypomelanism. Alligator snapping turtles usually have a brown skin. Hypomelanism shows up as pink skin with freckles. It also gives the turtles white irises and light-colored keratin on their beaks and most of their shells. 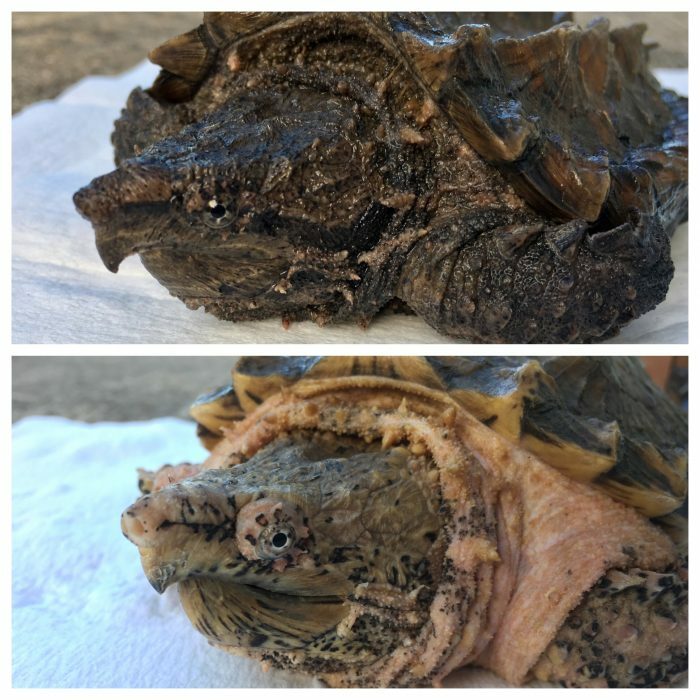 The top photo is what a typical alligator snapping turtle looks like. Below is a turtle with hypomelanism. Dr. Day Ligon, MSU associate professor of biology, advises Sardina. They noticed the hatchery has no adult males or females with the condition. Still, some turtles were born with those traits. Sardina found that the hypomelanistic turtles’ eggs took longer to incubate and were smaller when hatched. Even over a 10-month period, these turtles did not catch up to the size of their wild-type counterparts. These turtles have the odds against them. Sardina observed that they were 20 percent more likely to have deformities. They were also 13 percent more likely to die. Before Sardina’s research, there was little to no data on turtles with hypomelanism. Though the cause is still unknown, Sardina has given the community a jumping off point to swim toward an answer. Sardina, who affectionally calls these turtles “pinkies,” knew she wanted to study them as soon as she saw them. She got the chance a year after she first saw them. “This new research lets Tishomingo National Fish Hatchery and others make informed decisions on conservation and reintroduction programs,” Sardina said. Each time Sardina presents this research, she receives interest from other scientists. At one conference, she was runner up in Best Student Poster. One day she hopes to know why juvenile pinkies are often half or nearly double the size of a typical turtle.